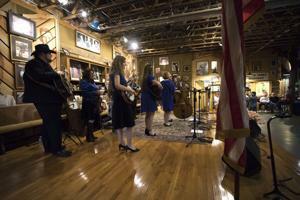 The Mountain Music Ambassadors perform at the Carter Family Fold on Saturday April 13, 2019 in Hiltons, Va.
“The opportunity to get to play the music we like and to get to do it for people who want to hear it on a stage that so many people who we look up to did, I think that is really cool,” said Stephenson, native from Wheeling, West Virginia. For other students, like Savannah Braddock, this is their first time taking the stage. Braddock is one of a few freshmen to ever attend the Carter Family Fold with the Mountain Music Ambassadors. The Carter Fold began by A.P. and Sara Carter’s daughter, Janette Carter, as a way for her to honor their memory and their contribution to the music industry, with their first recordings in 1927. “To step on this stage is a wonderful feeling because there is so much history right here,” said Raymond McLain, the KCTM director at Morehead State University. Rita Forrester, Janette Carter’s daughter, is now carrying on the Saturday night tradition. “When I come here everybody has got their arms open and it’s just ‘welcome we’re glad you’re here’ and that’s the way my mom wanted it,” said Forrester. Stephenson said this time at the Carter Fold brought a whole new experience, between learning new music and seeing improvements in herself. “I can see a lot of improvement in my own playing since last year,” said Stephenson, a Traditional Music major and English minor. During the three-day tour, which started on Thursday, April 11, the ambassadors made rounds through Tennessee and North Carolina, where they played on WJHL-TV, at the Pickin’ Porch and the John C. Campbell Folk School. Bringing the mini-tour to an end at the Carter Fold was something the band agreed they wouldn’t miss the opportunity to be there. “We were just all talking backstage and there is no-where we would rather be and nothing we’d rather be doing than right here tonight,” added McLain, who first performed at the Carter Fold in 1974. Forrester said having lost a lot of her family, McLain being back and brining his students is like having family home again. Stephenson added that she hopes to one day play banjo in a bluegrass band and values the experience the little piece of history along the A.P. Carter Memorial Highway has brought. Despite hurricane Florence hitting Raleigh, NC, the Wide-Open bluegrass festival remained open for business, which brought Morehead State University Students to the grounds. A group of five students from the Kentucky Center for Traditional Music, making up the Mountain Music ambassadors, made it to the International Bluegrass Music Association (IBMA) convention on Tuesday with anticipation for the upcoming week of non-stop bluegrass tunes and features from their idols.